Spacious, child-friendly holiday home, directly on the golf course. 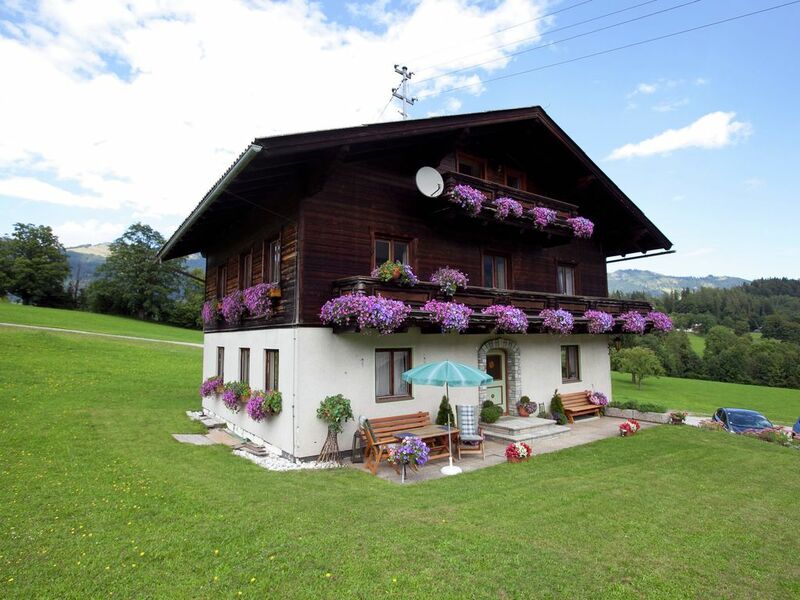 Goldegg - known for its beautiful location in the midst of Salzburgerland, for Goldegg Castle, fantastic cross-country skiing, a beginners ski slope, wonderful warm swimming in Böndlsee Lake and of course the golf course situated right in front of the house - is an ideal destination for your holiday! Your holiday apartment is on the first floor of this wonderfully situated house and has 2 bedrooms, a small bathroom, a spacious living room with a kitchen and a great sunny balcony. The view is just like a picture from a postcard. The separate areas are connected by the central staircase, which is also used by the owner of the house. This apartment is paradise for the kids as well. They will have a great time playing in the garden that surrounds the house. I'm surprised that there aren't many comments about this place. I visited for a short holiday (2nights) though it was perfect for my purpose. The host family was very respectful for your privacy and the quiet atmosphere. I've known that this area is also nice for cross-skiing and golf but as my purpose of this trip was doing literally nothing and only chill, it suited perfectly. I woke up by the sun and the birds chirping. Kitchen has a nice cute terrace (just as you can see from above photos) and is very nicely equipped - induction is installed instead of those old hotplates in the photo. Plates, disches are very pretty and clean. Actually the whole area in the house was very very clean. Mountains are beautiful, neighbor hoods are quiet but nice. I would definately recommend it for those who just want to be stuck in the nature doing nothing (or cross-skiing\/golf) for few days without having any disturbance. * Supermarket (properly big) is 5-7min. apart (by car) from the cottage but even the way to the supermarket is enjoyably beautiful. It is a neat but very simple accommodations with the amenities you need and a hospitable owner. The available spaces (bedrooms, kitchen / living room, toilet and shower), however, are a central staircase where the remaining residents occasionally have withered. You do not own entrance / entrance so. You get used to it, but it's not really great for your privacy. Mooi uitzicht en rustig gelegen. Ausstattung eher gering (Kleinigkeiten in der Küche: kein Spülmittel, kein Schwamm, kein Schneidbrett, usw./WC: wir haben selbst WC Papier gekauft), Bad zu klein, WC am Gang im Treppenhaus. Es gibt leider wenig Privatsphäre, da das Treppenhaus offen ist und von dort alle Zimmer weggehen und die Hausherren natürlich auch dort durchgehen und in der Etage, die vermietet wird auch ein Privatzimmer haben. Und im 2. Stock ist auch noch ein Privatbereich, der nur über das allgemeine Treppenhaus begehbar ist. Zudem ist es im Haus recht laut, weil ja die Hausherren dort wohnen und den Alltag eben so leben wie immer. Kontakt/Anschluss zu den Hausherren war eher gering.